Review of Art Venues in Ulster, Northern Ireland: Exhibitions, Group/Solo Shows, Exhibiting Artists, Opening Hours. As the capital of Northern Ireland and its leading centre of arts and culture, Belfast is home to a diverse range of art galleries. The most important is the Ulster Museum, followed by the Naughton Gallery at Queens, but there are numerous others ranging from the Ormeau Baths Gallery with its innovative exhibition and education program to the long established traditions of the Tom Caldwell Gallery. Here is a small selection of additional art spaces in the city. As well as their fine art, all have a good knowledge of the Irish art market and offer a variety of art consultancy services, as well as valuation and framing. Opened in 1964, and offered exhibition space throughout the 'Troubles', making it one of Belfast's longest established art venues, the Bell offers a wide range of Irish art, while specializing in modern British paintings, drawings and sculpture, and also nineteenth and twentieth century Irish painting and sculpture. Price range is 750-15,000 euros. Dealing in fine art for over 15 years, Charles Gilmore presents a wide choice of contemporary Irish Art as well as established artists like Jack B Yeats, Paul Henry, William Conor, Louis Le Brocquy, Colin Middleton, Paddy Lennon, Dan O'Neill and Gerard Dillon, as well as painters like Basil Rakoczi and Kenneth Hall from the White Stag Movement. Founded in 1989, Gormley's is one of Ireland's leading art galleries with three venues - in Belfast, Omagh and Dublin. Presents high quality artworks from more than 100 major and up-coming Irish artists, including sculptures displayed in Omagh's dedicated sculpture gallery, and incorporating a wide range of art available under 1,000 euros. Gormley's galleries host regular major art shows and participates in numerous Arts Fairs and events throughout Ireland. 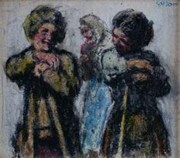 Presents nineteenth and twentieth century Irish art, alongside a range of contemporary artists from Ireland and overseas. Its specialties include Primitive Irish painting. Artists include Jimmy Bingham, Comhghall Casey, Sasha Harding, Noel Murphy, Rhonda Paisley, and Ross Wilson. Stages 7-10 exhibitions each year. Nicholas Gallery is one of Ireland's leading art galleries, dealing in contemporary as well as traditional Irish art. Works represented include drawings and paintings by Sean Scully, Jack B. Yeats, Tony O'Malley, Hughie O'Donoghue, Robert Ballagh, Louis Le Brocquy, William Scott, Barry Cooke and Peter Collis. Some of these artworks have rarely been seen in public.  For more about Belfast arts venues, see: Irish Art Guide.